Has there ever been a more controversial guard than the 50/50 guard? 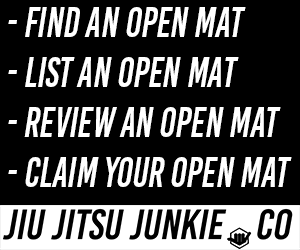 When the guard first emerged at the highest levels on the IBJJF circuit, many people, including multiple world champions, decried it as being nothing more than a cheap stalling guard that results in no real progression of the position. Despite that, the 50/50 guard is still actively in use today on the competition scene, even though the IBJJF changed its rulebook in March 2015 so that no advantages are awarded for an ‘almost sweep’ from the 50/50 guard specifically. In today’s article, we will take a brief look at the history and development of the 50/50 guard and its use in the gi, no-gi and even MMA contexts. While the 50/50 guard was first seen in BJJ as an incidental position, as in the case of Saulo Ribeiro vs. Roleta in 1997, its real development in the context of the gi was from the Mendes brothers, whose innovations in the De la Riva guard and leg drag have made those positions competition staples today. The Mendes brothers, particularly Rafael Mendes began to extensively use the 50/50 beginning in the late 2000s, particularly against the highest level opponents, and his matches against Cobrinha, the majority of which he has won, were usually won via sweeps and advantages from 50/50. However as the position continued to develop, more submission attacks were developed from the 50/50, namely footlocks, toeholds, and kneebars, many of which came from students of Rodrigo Cavaca as well as Cavaca himself. Cobrinha himself famously won the 2008 IBJJF World Championships with a toehold from the 50/50 against Bruno Frazzato. Athletes from Team Lloyd Irvin, such as Keenan Cornelius and JT Torres (now Atos) also enjoyed competition success with the armbar from 50/50, with Keenan successfully applying it against Joao Miyao at the IBJJF Pan American Championships and against Garry Tonon at Lloyd Irvin’s Brown Belt Kumite challenge while JT Torres has successfully applied the same armbar against Caio Terra. For the IBJJF gi scene, despite the ongoing stalling accusations against the 50/50 guard, it doesn’t look like it’s going away anytime soon; in fact in the latest 2016 IBJJF World Championships, the 50/50 guard again came to the fore in the finals match when Rafael Mendes went against Marcio Andre, with Rafael Mendes winning on points. But what about in the no-gi context? While the 50/50 guard was being hit with stalling accusations, another (former) Team Lloyd Irvin athlete, Ryan Hall, was tearing it up on the no-gi circuit with the 50/50 guard, and his victories were not points or advantages victories either, but with the dangerous inside heel hook submission. Ryan Hall was not a black belt at that time; however he did manage to defeat Rafael ‘Gordinho’ Correa in the ADCC 2007 alternate match using the 50/50, causing injury to Gordinho’s knee. Nevertheless, Ryan himself has acknowledged that many of the opponents he defeated using the 50/50 had limited knowledge of the position. While the knowledge of leg locks and heel hooks in particular are on the rise with the emergence of numerous submission only tournament formats such as Metamoris, Polaris, and EBI (where the most common submission in no-gi matches is the heel hook), the current trend tends to favor more unequal leg entanglements such as the 411 and ashi-garami positions. Nevertheless the 50/50 is still in use in those contexts with Keenan Cornelius defeating Kevin Casey at Metamoris via 50/50 heel hook. In the prestigious ADCC tournament, Cobrinha and Rafael Mendes have also met several times in the finals, with many 50/50 battles and attempted heel hooks, although none have submitted each other in ADCC. What about in the MMA context? While leg locks by themselves are quite rare in MMA, there have been only a couple of instances of the use of the 50/50 heelhook in MMA, one by Sergio Moraes in the preliminary matches of TUF Brazil and another by Ryan Hall, also on TUF. In conclusion, despite the controversy, the 50/50 guard is likely to continue to be used in both gi and no-gi contexts. And while it can indeed be used (very well, I might add) as a stalling and ‘advantage hunting’ guard in the IBJJF context, the increasing popularity of submission only tournaments, both in gi and no-gi will likely continue to spur further development of true offensive capabilities from this guard.